does being welcoming mean constantly being “on”? Image: Illustration from The Little Book of Love (16th c.). 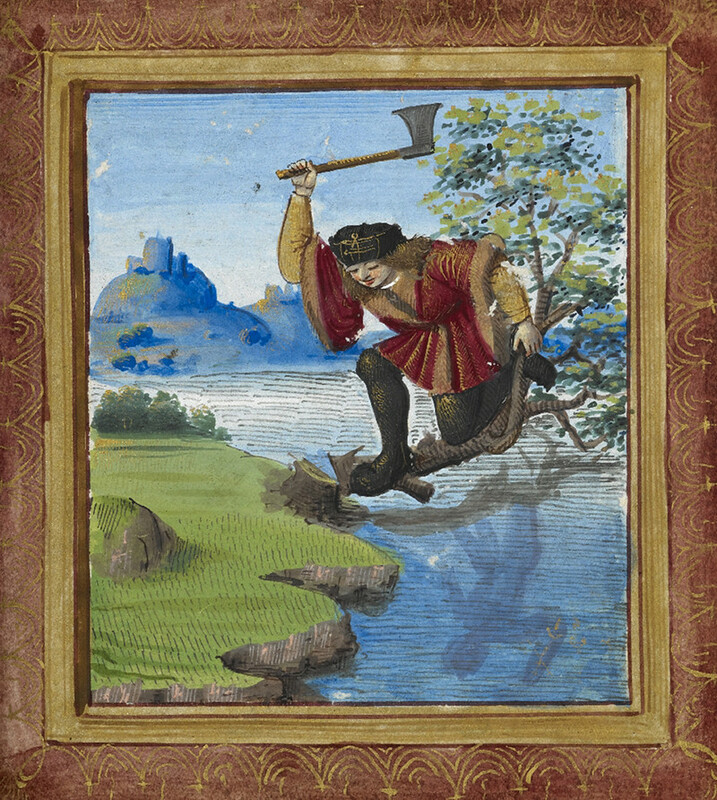 A man stands on a tree extending out over a body of water, chopping the tree off at the root. This week I’ve been haunting the comment threads over at Student Activism, one of my favorite personal blogs, where we’ve been discussing in wide-ranging form the fallout from Jonathan Chait’s piece (of click-bait) on “political correctness” (which doesn’t exist) and community norms. See this post, this post, this post, and this post if you want the specifics. I don’t want to rehash complex debates from the comment threads here; what I want to riff on is the question of the responsibility of any group to outsiders who are considering becoming insiders. Chait, and those who agree with his perspective, argue that certain ways of enforcing group norms in a given community (in this case the political left-liberal coalition) end up alienating newcomers who are embarrassed, shamed, or vilified for transgressing a community ground-rule. This, they assert, is bad politics: The community will not grow into an effective force for political change if people are made to feel bad and leave never to return. At is most basic, this is a question to take seriously: how welcoming is the left? Or, more generally, how welcoming is [insert group of choice herein]? Back when I attended church on a regular basis, this was a perennial question, the question of the welcoming church. How did we greet newcomers? How did we invite them to stay? Were we too hands-on, not hands-on enough? How would we ever grow the congregation if adherents never became members … and so forth and so on. It seems like a goal — being welcoming — that few people could or should disagree with. But I’ve been mulling over a couple of facets of this question in the past few days and I want to share my questions and concerns with y’all here. First, it’s interesting to me how this narrative of political outreach places the burden almost entirely upon the existing community members, even in situations where the existing community members are marginalized in the wider cultural context and their interlocutor is not — at least when it comes to the issue at hand. One example we used in the discussions linked above is a situation where a trans member of an organization is persistently mis-gendered by a newcomer: To what extent should the organization and its members set aside the harm done to the trans member by the newcomer on the grounds that, “Well, we don’t want to turn her away from the cause!” Many lefty organizations would put the right of the trans individual to feel included as a full member in the community above the right of a visitor to feel comfortable in their choice of language. It is this centering of the trans person’s experience and corresponding de-centering of the newcomer that has come under fire as an unwelcoming dynamic. Yet it is only unwelcoming to the individual mis-gendering the trans person. It is affirmatively welcoming to the trans person, who experiences positive affirmation that her community will support her agency and autonomy. When we talk about being welcoming, inclusive spaces we cannot theorize space in the absence of a larger political realm in which some groups are welcomed and included as a matter of course while others are dismissed, erased, discriminated against, maligned. My question here is, does the rhetoric of inclusion (by the insiders of an outsider) — particularly in a situation where the immediate insiders are, in fact, structurally treated as outsiders within the larger culture — place an unequal burden on the existing members of a group to be welcoming while not expecting much from the newcomer? In the context of interpersonal relationships, for example, we would look askance at a one-sided situation in which one individual was expected to bend over backwards to meet the second individual where they were at, while the second individual was allowed to remain comfortably in their own routines and understandings: The boyfriend who expects his girlfriend to listen to all the music he loves while never taking the time to learn what her musical tastes are. The American who expects her Korean girlfriend to communicate in English while not taking the time to learn her partner’s language. In the interpersonal context, we would critique the power dynamics in that relationship. It seems to me we might think about organizational inclusion in a similar way: People within an organization should be open to learning about and from newcomers who arrive in good faith, and newcomers should be willing to learn unfamiliar, and perhaps uncomfortable, things in order to build a successful relationship. Second, I’m struck by the way our networked lives have collapsed the boundaries between public and private space, making conversations that were once internal to existing groups more public. This is not a novel observation. In this specific context, however, what it means is that outsiders/newcomers can see and even participate in discussions geared toward insiders/community members. I’m reminded here of danah boyd’s observations (in It’s Complicated and elsewhere) about how teens sometimes react in horror when their mother comments on a Facebook conversation meant for their friends. The boundaries between public and private social spaces have become more fluid, and we are still working out the etiquette of joining an “overheard” conversation on the Internet. The result is that, in my experience, thinkers and activists (and thinker-activists) within identity-conscious movements on the left sometimes find themselves subject to the demand to always present an acceptable, welcoming, outsider-legible public face. This probably happens elsewhere on the political spectrum, too, but my experience is specifically from within these left-leaning coalitions. Bloggers, for example, who maintain high-traffic blogs around specific social issues find themselves constantly critiqued for their “unwillingness” to educate newcomers in comment threads who join the discussion without learning community norms or doing basic research about terminology or the topic at hand. But just because a conversation happens in a public space doesn’t mean it is necessarily a conversation meant for everyone or meant as a recruitment tool. When I’m at a coffee shop and the group of students at the next table over is having Bible study and prayer circle meeting, I understand that this meeting — though in a public space — does not automatically welcome or include me. It not an event geared toward welcoming me into the group — if I leaned over and said, “Oh, by the way, I’ve never understood how Christians reconcile the multiple creation stories in Genesis, could you explain that to me?” I might get a response but it would be a rude interruption of the group’s planned agenda. I shouldn’t feel entitled to attention and explanation from the group in that instance. But because the Internet is a relatively new type public space (danah boyd called it a “networked public”), we’re still working out what is the social norm in different contexts around joining a conversation. In the meantime, sometimes individuals and groups feel inordinate pressure to always communicate in a way that is accessible to the newcomer — and sometimes newcomers feel rejected or shut out of a conversation they want to be a part of. I would argue that we need to respect the fact that sometimes events that happen in public spaces are not for the public — and we should not expect them to be, or suggest they are failures for not being so. Finally, I have been thinking about how our discussions about outreach, education, communication, and learning might privilege interaction styles commonly known as extroverted. Many types of political engagement, political organizing, political activism, are collective (often in-person) group activities. And collective activities usually take social energy. Some people have more social energy — or are more energized by social activity — than others. These activities take effort for me. I had a day a couple of weeks ago with three back-to-back meetings lasting all day — by the time the third meeting rolled around I could barely form sentences. It’s not that I was disengaged from the meeting — I actually cared deeply about the work we were doing there — I was just overwhelmed by the need to be “on” for ten hours straight. Our apocryphal stories about “political correctness” gone awry, about progressive spaces being unwelcoming, often turn on the notion that education ideally happens through intense interpersonal engagement: A class discussion, a first-time attendee at a meeting, a Twitter debate. And the critics who challenge us to be more welcoming often seem to be upholding in their minds’ eye a Lefty Organizer whose patience should be limitless, whose energy comes from an overflowing well, whose calm and caring demeanor can magically transform those with whom they come in contact. It’s a wistful fantasy — oh! that I would have such bountiful reserves! — but an ideal against which we will forever fail. And, I would suggest, it’s an ideal weighted heavily in favor of those who have strong, sure social skills. Sometimes, we need to say “no, I don’t have the spoons to help you understand this issue right now,” and sometimes that needs to be okay. On the neophyte side, I think the formulation of “a newcomer who shows up at a meeting to learn and is turned off by conversation she doesn’t understand” discounts the value of listening without immediately speaking, or sitting on the sidelines and observing, of taking the time to do background research, and to assume you’ll figure out what is happening through context. These are all skills that people with introvert qualities are often extremely good at — and it makes me wonder whether people who feel rejected by group dynamics when they seek out a new organization are disproportionately extroverted. It might go some way to explaining why they seek out social modes of learning, and try to engage in debate as a way to find their footing. It seems to me that one way to change the dynamic for the better would be to approach new situations, as an outsider, in a more intelligence-gathering, ethnographic mode rather than in a “sell me on this new program or product!” mode. Social justice movements are not products, they are communities made up of human beings which grow and change over time — much like any culture! And there is a learning curve in any new cultural space. We have tools to cope with that culture shock, with that displacement and alienation — and many of them don’t involve demanding that the culture in question change so as to be more palatable to us. Wow. I’m going to go back and read the posts you referenced for the larger picture – but this gives me a lot to think on. As both an introvert and a person who struggles to find enough spoons, my favorite part was this: “Sometimes, we need to say ‘no, I don’t have the spoons to help you understand this issue right now,” and sometimes that needs to be okay.’ ” The internet is a much easier space for me to inhabit than more traditional public spaces, but there are still times when I have to walk away from what feels like a really important conversation because I just don’t have the energy to keep going. I’ve been thinking a lot about “political correctness” and genuine, difficult conversations about how to be more inclusive and more respectful, and the very real impact of language on culture and perception. I’m very much in favor of and interested in these efforts and conversations. But it is also true that there are some participants in these conversations who also seem to truly (and ironically) enjoy positions of power within a social circle as the Prime Arbiter of Rightness, and who can be truly ruthless in their smackdowns of people who fumble in these discussions – or who are respectful participants who simply offer up an alternate viewpoint that the Arbiter doesn’t like. An example: I have been body-shamed several times by other *feminists* who felt they had the right to critique me on how I chose to dress on a given day. If that’s not the ultimate irony, I don’t know what is. What is essential, I think, to these conversations is that we always keep in mind that we have more to learn from other people’s experiences – that is, after all, the point. And I think your point about introverts and extroverts is yet another dynamic we should try to be aware of in our attempts to be all inclusive. It would help a great deal if very vocal, social people were more sensitive to that dynamic – sometimes they haven’t successfully made a point at all. Sometimes they’ve simply worn out whoever they were talking with.